If your business or organization would like to decorate a tree, complete & return this form and $25 to the Main Street office. Thank you for participating! 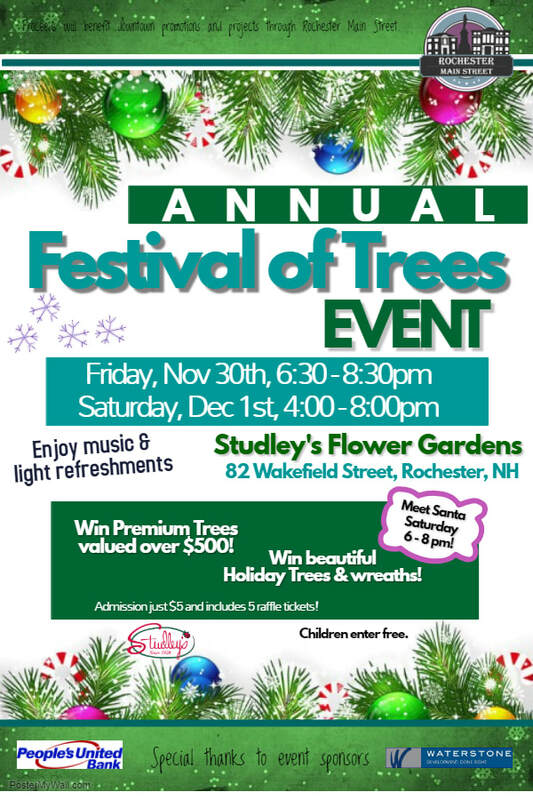 Join us for our third annual Festival of Trees event held at Studley's Flower Garden's greenhouse at 82 Wakefield Street! Enjoy caroling, refreshments, and Santa Claus while strolling through dozens of wonderfully decorated trees, generously donated by area businesses and organizations. 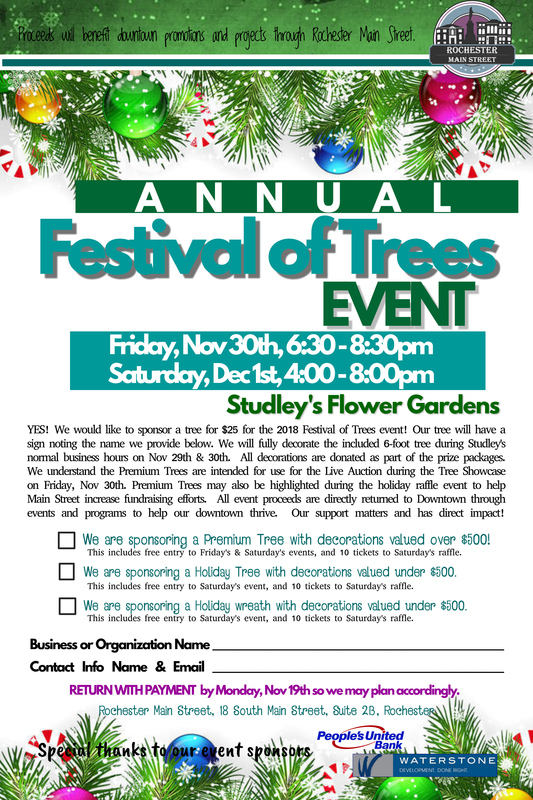 Get a sneak peek of the trees during Friday's Tree Showcase, and enter the raffles early! Then enjoy the traditional Festival of Trees event Saturday and enter for your chance to win! This year we are featuring Premium Trees with values over $500! You can also win Holiday trees and wreaths, fully decorated and with prizes! Enjoy live music and refreshments as you stroll through the beautiful trees. Visit Santa after 6:00pm on Saturday! Admission is just $5 and includes 5 raffle tickets! Children enter free. Additional raffle tickets for Saturday's drawings will be available both days. Purchase as many as you'd like to increase your chance of winning, and to support a great program. Proceeds from the event benefit downtown Rochester promotions and events. Special thanks to event sponsors Waterstone Properties and People's United Bank!